This game is all about risk perception and assesment. It is based upon an event that happened in the north of The Netherlands, the Horse rescue at Marrum (2006) (YouTube, English). Quite some horses were standing outside the levees while the water level was rising due to various weather conditions. 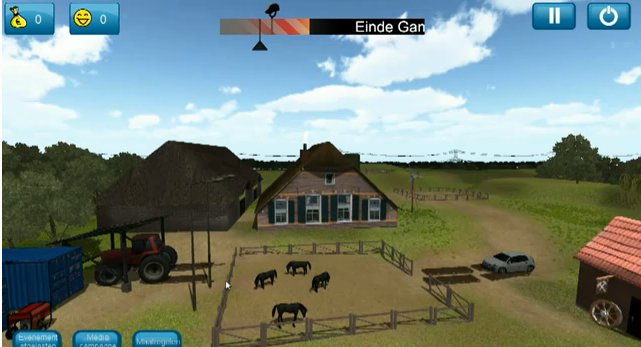 The same scenario can take place in the "Floodrisk at Manage Noorwaard" game (which was developped in just merely three days), where horses are also outside the levee. The player will constantly receive forecast information and following that has to decide wether to take any actions such as moving the horses to higher ground, or in the worst case, evacuate them. Horses cannot really cope well with a lot of stress, so some actions might lead to the death of horses as well. It is up to the player to assess how the events will develop and what measures to take! See the small Youtube video for a short introduction to the game. HKV was also a partner in this project.